When it comes to choosing a holster you want to be sure you are getting one that is made with good construction and high-quality materials. There are countless discount holsters out there that will get the job done but can damage your handgun r be a safety hazard. When you are looking for a holster you should look for one of the best AIWB holsters. 1 What is an AIWB Holster? 2 How is This Different From an IWB Holster? 3 Why Not Just Buy A Second IWB Holster? 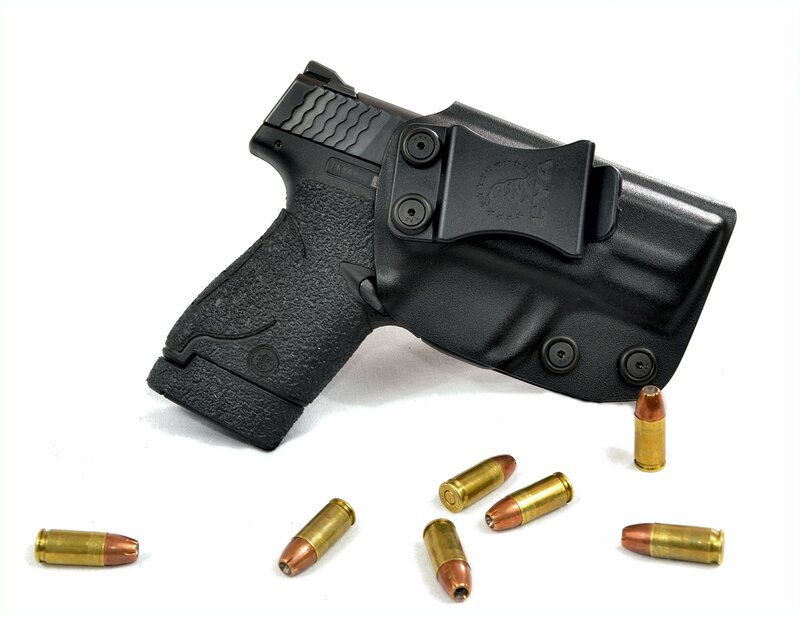 What is an AIWB Holster? An AIWB holster is simply an appendix inside the waistband holster. In layman’s terms, it is a holster that goes inside of your pants waistband and goes in the front. Because of the design of the holster, it can comfortably and safely be mounted to either your left or right side in the front of your pants for added comfort. How is This Different From an IWB Holster? An IWB holster is an inside the waistband holster. The means it is still mounted inside of your pants, but it is side specific. Most of these are aimed at right-handed carriers since the vast majority of the population is right-handed. Just because right handed models are more common, that does not mean that left handed models do not exist. Left handed models are, however, more difficult to find and you may have trouble finding one for your specific model handgun. Many left handed IWB holsters are universal. These are not going to protect your handgun as well but will hold a wide range of models. Why Not Just Buy A Second IWB Holster? This is going to come down to personal preference. IWB holsters, in general, are not that expensive, so buying a second for you other side is not a bad idea, but the convenience of having an ambidextrous holster is worth it to some buyers. First on our list is the CYA Supply Co. Shield holster. It is capable of holstering a Smith and Wesson Shield 9MM or 40. While this may not be a huge range of models, it does support one of the most popular handgun series currently available and two of the most common sizes. Unlike the others on this list, the CYA Supply Co. holster is not truly ambidextrous. Instead, it can be ordered as either a right or left-hand draw. The only difference between the two is the side that the clip is on since it needs to face outward to clip onto your belt. This holster is made with Bolton, a high density, impact and temperature resistant hard plastic. This will keep you gun safe if you happen to fall or run into something and will also keep the holster from wearing out too soon or getting brittle from being exposed to extreme cold or heat over time. Because this is not a universal holster, the holster is molded specifically to fit the Smith and Wesson Shield series. Thanks to this you don’t have to worry about your sights or safety getting caught on the stitching. This makes the holster overall safer and easier to use compared to a generic, universal holster. • Boltaron shell to protect your gun and ensure a long service life. • comes in both right and left-hand configurations. • Supports Smith and Wesson Shield 9mm and 40. • Limited gun model support. Right away you will notice that this is not your typical holster. It uses the elastic material to hug your waist, rather than go inside your waistband. While it is not technically an IWB holster, it is easily hidden and ambidextrous. This makes it one of the most flexible holsters to make this list. One of the biggest pluses of this holster over the others on this list is its carrying capacity. The hip hugger can be used to carry up to three handguns and extra magazines. This sets it well apart from another holster which usually only carry your handgun, no extra magazines. The material, while stretchy, is also great at sticking to your clothes thanks to a soft rubberized liner on the inside. This should keep it from slipping around throughout the day from use and will keep you comfortable since you won’t have to be adjusting it throughout the day. It is also hypoallergenic which is good for those with sensitive skin. Thanks to the design of this holster you can holster your gun at several different positions including in front and at the kidneys. This allows for an easy draw no matter you preference. You can also set the angle of the draw by adjusting the included clips. About the only downside to this holster is the fact that it does not come in a unisex model. 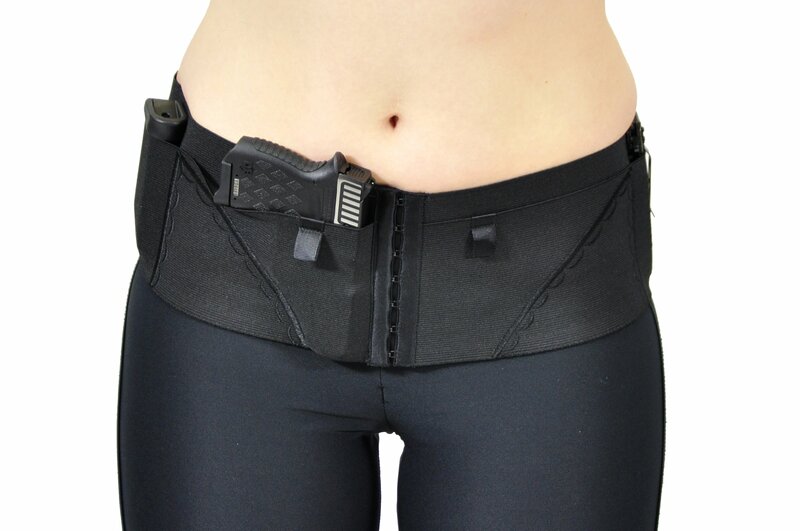 This holster is specifically designed for women. While men can use it, do not expect it to be as comfortable as it should be. Currently, the manufacturer does not plan to offer a unisex model. • Can hold multiple guns. • Can store extra magazines. First, it is worth mentioning that Blackhawk does not manufacture this holster. It is actually made by ATK or Alliant Techsystems. For those who are not familiar, ATK is a big name in the weapons and aerospace industries, so expect a good product from them. Blackhawk simply re-brands them but advertises that they are made by ATK. 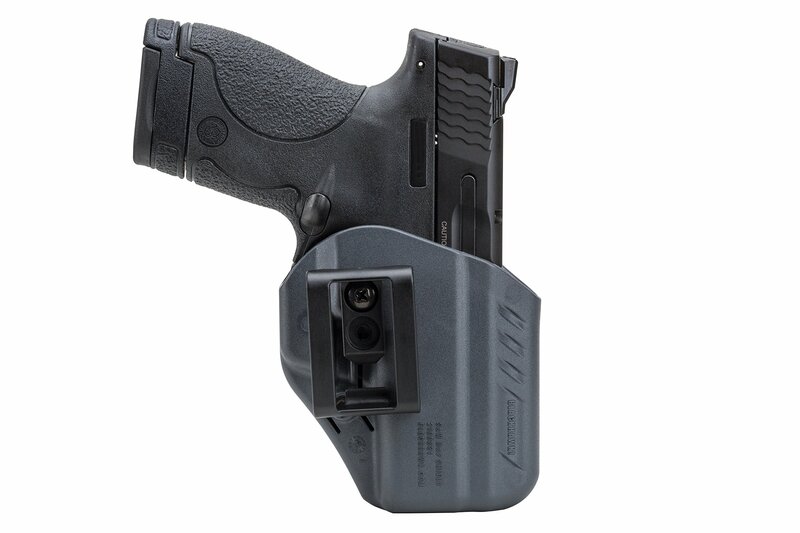 This holster is not universal like some other AIWB and IWB holsters but instead is specific to the Smith and Wesson Shield series of handguns. These come in a range of common sizes and this holster should accommodate any from this series. It may also support other Smith and Wesson models, but they are not officially supported. This holster is instantly reversible since it uses two separate clips as opposed to a single clip that must be switch on one side and the other. Thanks to this you don’t have to worry about taking the time to swap the clips or finding the tools to remove it, simply switch the holster to the other side of your pants. The clips on the Blackhawk holster are adjustable. This allows you to fit it onto any belt that is between 1.5” and 1.75” wide. This should cover most men’s belts easily and some women’s belts as well. You can also adjust the cant which will allow for adjustable draw angles for maximum comfort and ease of use. • No need to swap the clips to change sides. • Supports most of Smith and Wesson’s Shield series of handguns. • May not fit most women’s belts. • Does not fit Shield 45. The best holster to make this list, by far, is the hip hugger. The only huge downside to it is the fact that there is not a unisex model and likely never will be. In every other category, however, this is the best holster to make this list. It allows you to carry multiple guns and magazines. This is the only holster to offer this. Coming in second is the Blackhawk. It supports most of Smith and Wesson’s popular Shield series of handguns. It should fit all but the Shield 45, so if you have one of those you will need to find a different model. The biggest advantage to this one is that you do not have to swap the clips, it simply comes with one on each side.